Take a brief glimpse at the headlines in the news or the arguments on social me­dia feeds and it’s obvious: Political divisions are deeper than ever. This is particularly true in the U.S., where a recent Pew Research study found that Americans believe there are stron­ger conflicts between political parties today than between racial groups or economic classes. The gaps in survey responses between members of politi­cal parties have risen from 15 points in 1994 to 36 points in 2017. That division spills over and creates a unique tension on college campuses. Students, faculty, and staff alike have proven they want to be involved in the issues that shape our national dialogue, but an increasing number of speakers or events have caused such controversy that any possibility of civil dialogue – conversation meant to enhance un­derstanding of others who hold differ­ent views, even if they still don’t result in agreeing with each other’s views – seems impossible. CCCU institutions, however, strive to be different. They seek to face these realities with courage and conviction. As Christians, we know that we can­not shy away from the hard questions of our day nor placidly accept division or schisms within the body of Christ. Jesus said that we will be known as his disciples because we love one another (John 13). Thus, our institutions are working to create spaces where honest conversations about contentious issues can occur, but within frameworks that foster love, build relationships, and seek to make peace. This article highlights just four of our colleges and universi­ties who have had great success creating space for civil dialogue on campus. From left: Justin Lee, an author and LGBT Christian activist, Jason Moyer, associate professor of communications at Malone University, and Christopher Yuan, author and professor at Moody Bible Institute, were part of the panel, “Gay and Christian: A Dialogue on the Faith-Driven Life” at Malone University. When Malone University (Canton, OH) launched the Worldview Forum in 1999, it was designed as a space for thoughtful conversations about theolo­gy. However, the Forum soon expanded and encompassed a different goal. Each Worldview Forum event features a panel of faculty and outside voices from the community. The university seeks re­spected experts who hold opposing view­points to come together in a conversation moderated by a faculty member. For example, the 2015 Forum “Black Lives, Blue Lives” featured local law en­forcement officers and church leaders. In 2004, Malone invited leaders from a pro-life crisis pregnancy center and the local Planned Parenthood for a conversation on “Fetal Life, Abortion, and Choice.” Other recent Forums have addressed Christian perspectives on capital punishment, the role of the U.S. in world affairs, and politi­cal partisanship. Opening the door to explorations of alternative opinions and worldviews is a critical piece of the college experience for students. Phinney noted that the Inter­faith Diversity Experiences & Attitudes Longitudinal Survey (IDEALS) and the National Survey of Student Engagement (NSSE) both show that Malone students benefit from a deeper examination of oth­er worldviews during their college years. The conversations held each year at the Worldview Forum also spark class discus­sions that give students the opportunity to engage with the opposing perspectives they hear on stage, making it an integral part of the Malone experience. All Worldview Forum events are open to the public. Those who partici­pate hope to model healthy, respectful civil dialogue to the wider community in Canton. At George Fox University (Newberg, OR), Jenny Elsey, associate dean of in­tercultural life, often heard students of color express the need for a safe space to talk about the issues and tensions they faced. In response, Elsey and her team created Mathetes, a series of monthly seminars on controversial issues. The programs are now student-led with support from Elsey and her team. Students pick the topic and speakers each month. The meat of each event is in the ex­tended Q&A time after brief comments from the panel. Students verbally ask questions from their seats. The group of about 70 people is just small enough to support a lively discussion in response to each question, and it’s not just the panelists who get to respond – it’s any­one in attendance. Mathetes facilitators also read a list of ground rules at the beginning of each eve­ning and repeat them if necessary during the group conversation. George Fox also involves student leaders in their efforts to create space for civil dialogue on campus by holding an­nual training sessions. Resident advisors and student government representatives watch the video series Convicted Civil­ity (created by former Fuller Theologi­cal Seminary president Richard Mouw) and learn how to engage in respectful dialogue with others without compro­mising their own values. They then par­ticipate in diversity training seminars, where they learn how to ask good ques­tions and relate with students of differ­ent racial backgrounds. Whitworth University president Beck Taylor (right) created the three-part President's Colloquy series to equip students with the skills and opportunity to engage the Christian approach to truth and disagreement. Whitworth University (Spokane, WA) first recognized the need for intentional civil conversation when an informal poll revealed that students, regardless of po­litical ideology, were dissatisfied with the level of discourse on campus. They felt they couldn’t talk to their friends about important issues. Whitworth president Beck Taylor saw an opportunity. “Christ calls us into these messy issues to be peacemakers,” he says. “Christian schools are shaping their students for leadership in diverse, plu­ralistic settings.” This year he set up the President’s Colloquy on Civil Discourse, a three-part lecture series on the Chris­tian approach to truth and disagreement. “We didn’t want to inundate students with weekly opportunities,” Taylor ex­plains. Instead, each of the three events addresses a carefully selected question. The first lecture asked, “Can we still speak the truth in love?” and laid the foundations for dialogue in Christian community. Professors from three de­partments gathered to discuss the dis­tinctive resources Christians have in the midst of difficult conversation. The second installment was designed to give students practical tools for dis­agreement, tolerance, and intellectual virtue. The final panel applied Christian foundations and practical skills to a con­temporarily relevant topic: the nature and parameters of free speech. “We picked free speech in part because the issue doesn’t divide people neatly on political lines,” Taylor says. The President’s Colloquy is already having positive impacts in the student body. 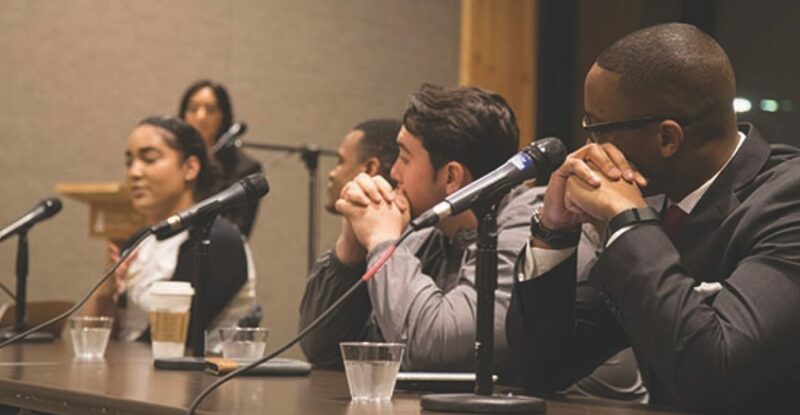 The student government, Associ­ated Students of Whitworth University (ASWU), holds Town Hall events where students gather to discuss difficult issues facing the campus. They had already identified the need to carve out a space for dialogue on campus, and the Presi­dent’s Colloquy provided the perfect partnership opportunity. Each Town Hall covers a topic se­lected by students and starts with a re­fresher on guidelines for civil conversa­tion. After an introduction to the topic, participants break into small groups to talk through a list of questions prepared by a panel of knowledgeable students. The small groups reconvene to share their thoughts and discuss action items with faculty members. For example, in a recent Town Hall on Deferred Action for Childhood Arrivals (DACA), speak­ers ended the session with tips on how to contact legislators about the issue. Students at Gordon College engage in a discussion hosted by the student organization ALANA, which provides support to students of color and works to increase campus knowledge of their history, culture, and contributions. Gordon College (Wenham, MA) has long been a campus bustling with diverse political viewpoints and activity. Howev­er, in 2015, during the height of the Black Lives Matter movement, the Student Life staff noticed another form of diversity that was not quite as prevalent. Gordon’s Office for Student Life cre­ated a Come to the Table program as one step to engage this reality. Come to the Table assigns students to a small group that meets for dinner four times during the semester with other students of dif­ferent backgrounds, cultures, and race. Groups are comprised so that half are white students and half are students of color. A pair of trained student facilita­tors, one a person of color and the other white, leads each meeting and assigns readings about race and reconciliation. It is an opportunity for participants to redirect and educate one another; a safe environment where even uncomfortable questions are welcome. GCSA is highly active on campus, voicing the opinions and concerns of students to the administration and working out points of tension. This puts Gordon in the unique position to model respectful dialogue directly with the stu­dent body. Recently, with the help of GCSA, some students at Gordon passed a res­olution asking the college to address actions and policies that have inadver­tently “caused hurt to the LGBTQ+ community.” Gordon’s leadership did not feel they could honor all of the reso­lution’s requests, but instead of leaving the students with a simple “no,” Student Life took the opportunity to start a big­ger conversation. “We wanted to honor the spirit of the resolution, because we are committed to helping our students know how to en­gage in touchy subject matters with re­spect and dignity,” says Rowe. In response to the resolution, Stu­dent Life staff partnered with GCSA to host a series on human sexuality en­titled “LGBT+ in Christian Communi­ty: A Series on Sexuality, Scripture, and Inclusion.” Its focus is to delve deep in the historic theological understanding of sexuality, while recognizing the need for better care for those who are part of the LGBTQ community. Rowe believes the event will place the original student resolution in the much broader context of the theology of human sexuality as a whole. These are just four institutions that have recognized and met specific cam­pus needs with grace and creativity. Every school will face its own chal­lenges and devise its own tools to ap­proach those challenges. However, a few common themes ran through the advice gathered from each of these ad­ministrators and students. To be effective, efforts to teach and en­courage civil discourse must be campus-wide. Get academic depart­ments, student activities, and spiritual life involved. If students are expected to engage in civil discourse, university leadership must also practice it. In addition to helping students better understand what healthy dialogue and civil discourse are like, event facilitators can help create a good environment for dialogue by reminding event attendees of some guidelines that will help the conversation move forward. Some ex­amples include speaking from personal experience and using “I statements”; speaking truth and personal conviction from a position of love, not of anger; and not interrupting others or cutting off moments of silence when they might be appropriate in the conversation. 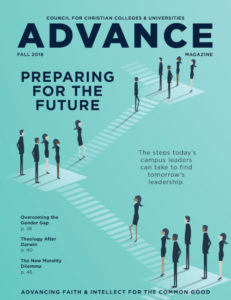 Whitworth’s Jeff DeBray and Gordon’s Davis Metzger both spoke about the benefits of proactive student govern­ments that plan events to help students engage in difficult topics. But even if a student government is not in the posi­tion to plan civic engagement strategies, utilizing student leadership in the plan­ning process can help administration-led efforts be more effective and interactive. Jesus instructed us to love the Lord our God with all our heart, soul, mind, and strength, and to love our neighbors as ourselves. Learning more about God and about each other helps us under­stand how we can better obey this com­mand to love. Jessica McBirney is the presiden­tial and government relations fellow for the CCCU and a graduate of Biola University.